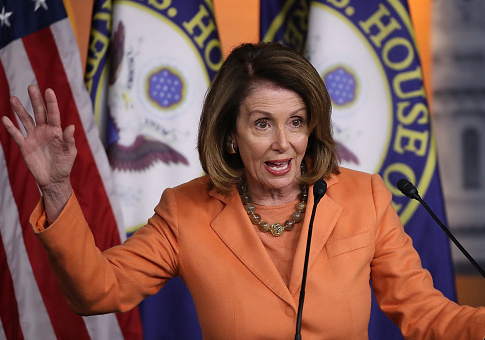 A Washington Post fact checker on Tuesday gave House Minority Leader Nancy Pelosi (D., Calif.) "three Pinocchios" for her tweet claiming that the new Conceal Carry Reciprocity Act would invite "violent criminals," "convicted stalkers," and "domestic abusers" to carry guns. The Washington Post conducted a fact check investigation into Pelosi’s since-deleted tweet to see if the new legislation would in fact empower dangerous individuals to carry a concealed weapon. The three pinocchio rating indicates the claim contained a "significant factual error and/or obvious contradictions" and was in the realm of "mostly false." "Inviting violent criminals to carry concealed weapons doesn’t have lives," Pelosi tweeted last week. "Inviting domestic abusers to carry concealed weapons doesn’t save lives. Inviting convicted stalkers to carry concealed weapons doesn’t save lives. Yet the House GOP just voted to do exactly that." The Concealed Carry Reciprocity Act was passed through the house with a vote of 231-198 last Wednesday and would make permits to carry a loaded concealed gun issued in one state, valid in all 50 states. According to a Pelosi spokesman, the representative’s tweet was based on information provided by Everytown for Gun Safety, a gun-control group funded by former New York City mayor Michael Bloomberg. The group claims the Rep. Richard Hudon (R., N.C.) sponsored bill "would even force states to allow concealed carry by many people with no permit whatsoever–allowing people who have never been screened by a background check to carry throughout the country." Hudson defended the bill, calling Pelosi's claims a "complete falsehood." "Liberal elites are either cherry-picking data to fit their agenda or blatantly ignoring existing law which prohibits these categories of people from even possessing firearms," Hudson said. The Post noted federal law does in fact prohibit people with a felony conviction, domestic violence misdemeanor, or those subject to a restraining order from buying a gun. Advocates of the act say the intended purpose of the legislation would be to allow people to keep their guns while traveling through other states without fear of legal repercussions. Federal laws currently allow for the transportation of firearms across state lines as long as the guns are unloaded and the weapon and ammunition contained in a locker container. Those who advocate for the Concealed Carry Reciprocity Act, however, say the existing law has little use for a tourist or traveler who feels unsafe or wants to protect himself in an unfamiliar area. Of Pelosi's claims, the Post found the only valid concern to be a possible loophole that might allow a person who was denied a concealed carry permit in his home state to seek one from another state. "There’s a grain of truth to that," Cato Institute policy analyst David Kopel said, noting companion legislation in the Senate more clearly outlines that the law would be for carrying outside of one’s state of residence. "So a Texan can’t use a Mississippi permit in Texas," Kopel said. However, Everytown argues the Senate version would still be harmful because if a Ohio resident obtained an Idaho permit, they would be allowed to carry in every state except Ohio. Overall, the Post determined Pelosi’s tweet was focused on one possible loophole and extrapolated the worst from there, using inflammatory language like "inviting." The Post also noted most states already have reciprocity agreements with other states for permitted travelers who wish to carry a concealed weapon. Pelosi’s office defended her tweet, saying "the bill is terrible." This entry was posted in Issues and tagged Concealed Carry, Gun Control, Guns, Nancy Pelosi, Washington Post. Bookmark the permalink.